A couple of days ago, Mike was in the mood for sushi and I was in the mood for not cooking, so when he suggested that we go to Fat Fish Sushi, I got in the car and went with him. Clearly, we had all forgotten about our previous experience at Fat Fish Sushi – which we proceeded to replicate almost to the letter. Fat Fish Sushi has become a very, very modest restaurant. Your order at the counter, but dishes are brought to the table. Prices don’t seem to have increased much since our last foray. Once again, Mike ordered the Lion King roll and the unagi, and once again the thought the former was unimpressive and the latter was OK. I ordered a bento box with beef teriyaki and chicken katsu. The beef teriyaki was just like the time before, bland with an overly sour sauce. The chicken katsu consisted of very small, thin strips of breaded fried chicke with an overwhelmingly sour katsu sauce. Neither was particularly tasty. Mika had a kid’s bento box with two huge breaded & fried shrimps (the breading had no flavor), a California roll, which she sort of liked, and chicken teriyaki, which had a weird consistency. In all, a meal that should not be repeated. I’m not a big Japanese food eater (indeed, I don’t eat sushi), but my husband and kids like it, so we go to sushi restaurants from time to time. 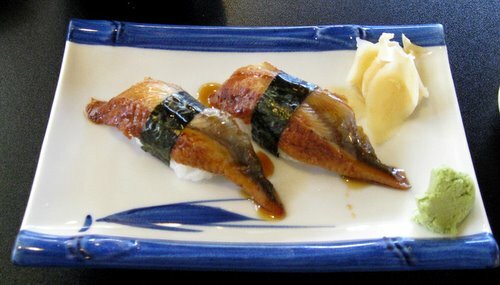 Of the handful of sushi restaurants in San Leandro, Ozeki Sushi Teriyaki was our favorite. I even liked their teriyaki. It changed names (to Fat Fish), and probably ownership, quite a while ago – and we hadn’t gone back since. Today, however, when I agreed to have Japanese food for lunch, that’s where we headed. I’m sorry to say that the food quality has gone down considerably. Even though I’m not crazy about the other Japanese restaurants in town, I would definitely not go back to this one. I had the beef teriyaki plate ($8). The beef was tender and lean, and the portion was quite generous, but the beef had not been salted and, in the words of my husband, it was “the blandest piece of meat I’ve ever eaten”. The teriyaki sauce tasted mostly of soy sauce (and yet, not a salty soy sauce). A little salt improved the meat considerably, but not the point of actually calling it “good”. Unless you like bland food, take my advise and skip it. You may also want to skip the Lion King roll (a California roll with baked salmon & tobiko). Mike speculates that the salmon & tobiko had been added to the top of the pre-made roll and quickly microwaved – the roll had both hot and cold spots. Needless to say he was not impressed. The miso soup and unagi ($1 per piece) were fine. In all, a disappointing experience.